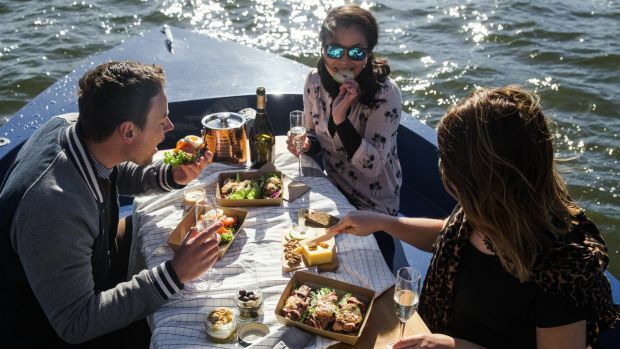 Soon you'll be able to skipper your own Scandinavian boat on Lake Burley Griffin and enjoy a leisurely picnic and glass of wine, no boat license required. GoBoat, which started in Copenhagen in 2014, now runs in multiple locations across Denmark and Sweden, and most recently, in London. Canberra will be the first GoBoat location outside of Europe, with local Nick Tyrrell launching the operation on Lake Burley Griffin, docking at the Kingston Foreshore pier. Mr Tyrrell first used GoBoat on a trip to Stockholm two years ago with his wife for a friend's wedding. "We didn't think too much more of it until we got home, and every day at that stage we had to cross the bridge over Lake Burley Griffin," he said. "And one day my wife turned to me and said, 'why is there nothing on Lake Burley Griffin? '` Then we got into this big discussion of how hard it is or some of the restrictions around it and we decided maybe we should take on a new challenge. "The lake is so clear, it's a great asset for the city but it's so underutilised and it's so hard for the majority of Canberrans or visitors to even consider it at all." Mr Tyrrell said the National Capital Authority were supportive of the concept from the beginning, but the ACT's boat license laws almost stopped the operation before it started. 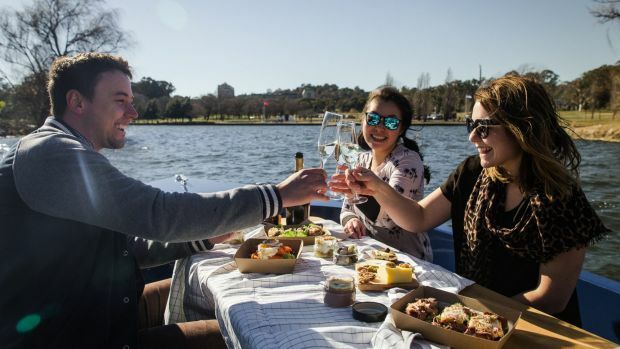 "Unlike any other body of water in Australia, in Canberra you to have a boat license to operate any powered boat on the lake, no matter how fast it goes. In other jurisdictions if your boat doesn't go more than 10 knots, you don't need a boat license. So that almost caused us to pack up our kit and go home," he said. "But by restricting the speed that people can operate, and we're only restricting it to the same speed [as GoBoats elsewhere in the world], and by implementing a strict safety program, we can rent the boats to people without a boat license." The boats are Danish designed and constructed from 80 per cent recycled PET bottles, they run on electricity, and create no wake. There is a picnic table in the middle, and eight people can fit on each boat including the skipper, who just must be over 18. "One of our aims is to really reduce the barriers of entry for people to get out and enjoy the lake. They don't have to be a member of a club, they don't have to have a boat license, they don't have to own their own equipment. We'll provide everything for them, and all they need to do is bring their friends, and turn up and go," he said. Passengers can bring their own picnic aboard, and the boats are also licensed, but the amount of alcohol allowed aboard will be limited for safety reasons. Water police are also able to breathalyse skippers, with the same blood alcohol limit laws applying as to drivers of vehicles. Mr Tyrrell has also partnered with Rye Cafe in Braddon, which has a Scandinavian influence thanks to co-owner Jacob Hoffmeyer's Danish background, to create a range of food and drink options which can be added to bookings. Canberra GoBoats will be available to rent for an hourly rate during daylight hours, with the rate reducing the longer you hire for. The boats are currently under construction in Denmark, with the first four expected to arrive in late September, and four more to follow soon after.